This system, the Axis SP2004, is quality-built with a high output four stage turbine which provides the power you need to atomize high viscosity materials, 7 psi at the gun. It comes standard with a professional series HVLP spray gun Accuspray Turbine Bottom Feed Gun -71000 designed to give automotive finish quality results. 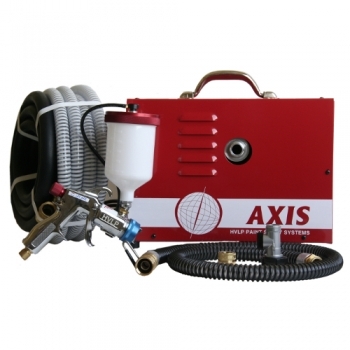 The Axis SP2004 HVLP Turbine Paint Sprayer system, is quality-built with a four stage turbine which provides the power you need to atomize most materials. It comes standard with a professional series HVLP turbine spray gun. Accuspray Turbine Bottom Feed Gun -71000 designed to give automotive finish quality results. Designed for all stages of finish work on autos, airplanes and motorcycles, marine, fine woodworking, and modeling using most materials. This is our top of the line HVLP Turbine Sprayer which provides more pressure for finer atomization. The SP2004 provides plenty of power for clears and other finicky paints, and is versatile and powerful enough to use for practically any painting task. Used widely by professionals and hobbyists. This is the one for the person who wants the best finish possible! To what do we attribute our claim for a great finish? The gun is the absolute heart of the system! No matter how much power is delivered, if the gun is inferior, the results will suffer. The SP2004 is a step above the SP2003 providing 7 psi atomizing power, 40’ of hose standard and a 4’ flexible lightweight whip hose which installs before the spray gun. 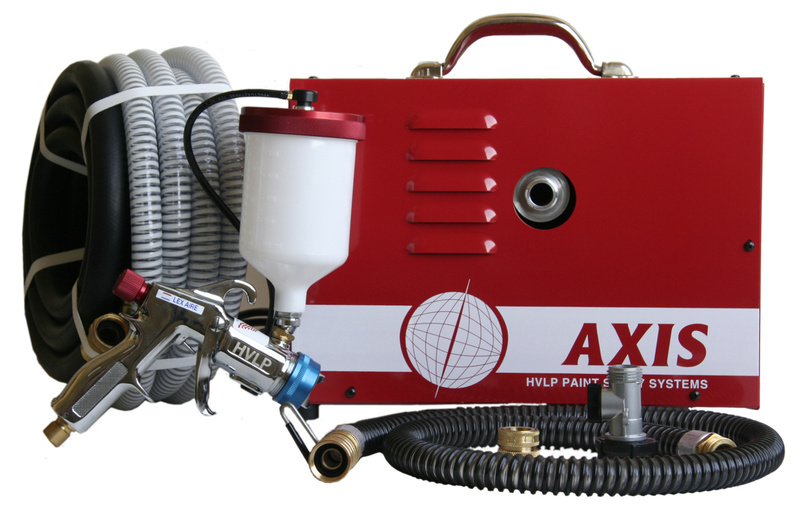 At Axis Air Group, Inc., we provide only the finest quality spray gun with our systems, specifically designed for turbine HVLP spraying. You don’t like to have problems with spray quality and we don’t like to troubleshoot – that’s why we buy the best guns available for turbine HVLP. We've tried them all - there is none better. Just Ask The Man Who Owns One! 40' of 3/4' Spray Hose which includes 10' of heat resistant hose and 30’ of spray hose.